Sandra, 72, and Lee, 78, were referred to Rebuilding Together Seattle through a local Fall Prevention program. Unfortunately, Lee had taken a serious fall in their home and—after the local fire department responded—the couple was identified having a high risk for repeat falls. In order to make sure that both Sandra and Lee could live safely and more independently in their home, they needed grab bars and other safety improvements made. Rebuilding Together Seattle came out to make those modifications in fall 2014, but realized that the couple’s home had other critical repair needs. Since moving into their current home in 1998, Sandra and Lee had for many years been able to keep up with the moderate amount of maintenance needed for their mid-century home. As a Marine having served three years during the Korean Conflict, Lee was used to working hard and—despite being well into his 70s—continued to work down the street at a gas station and car shop a few days each week, both as a way to earn a little extra money to supplement their Social Security payments and to keep active. However, this past spring their house had a major roof failure following heavy rainstorms, and the entire back half of their house was inundated with water that caused visible damage to ceilings and flooring, and damage to the walls. Sandra and Lee were able to have the roof repaired, but were still unable to repair the ceiling, walls and windows, or replace the flooring. After some investigative work on the condition of the walls— and particularly the insulation behind the walls—Rebuilding Together Seattle was able to get to work. With the help of Sears’ Heroes at Home volunteers, they repaired missing sections of the ceiling, fixed damaged light fixtures and stabilized the buckling subflooring under the carpet. Separate from the repairs needed due to the roof failure, volunteers also completed minor repair work to the bathroom—including replacing a tub surround and resetting a toilet—and completed some interior and exterior painting and clutter removal. Lee served his country as a Marine, and Rebuilding Together and Sears are honored to have been able to serve him and his wife by ensuring that they have a safe, healthy and accessible home! 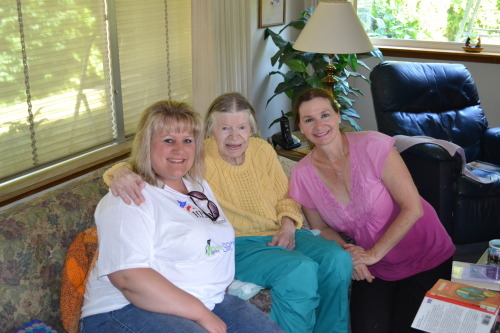 The Heroes at Home Program is a collaborative partnership between Sears and Rebuilding Together. 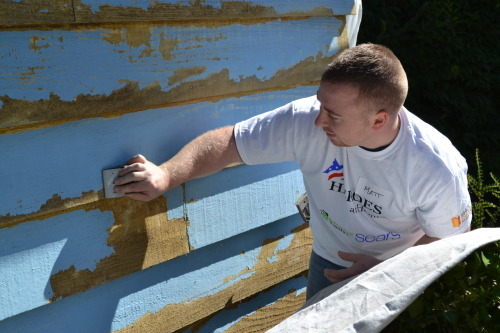 Since 2007, more than 40,000 volunteers have donated nearly 320,000 hours to serve low-income members of the military, their families and veterans by making the critical home repairs and modifications they need to ensure a safe and healthy home. To learn more, and to support Heroes at Home, visit sears.com/heroes.